Jeep Wrangler Unlimited has 285-horsepower, 3.6-liter V-6 engine, Six-speed manual transmission; available five-speed automatic, Four-wheel drive, Solid front and rear axles, Under-body skid plates, Available dual locking differentials, towing package with trailer-sway control, and an electronically disconnecting front stabilizer bar. The Jeep Wrangler Unlimited is available with several different axle gear ratios, allowing customers to optimize fuel economy and/or vehicle capability. Wrangler is available with 3.21, 3.73 or 4.10 ratios depending on model. Also, Wrangler offers towing capability up to 3,500 pounds, great for hauling small loads, or doing chores. An eight-speaker stereo is standard and an updated Alpine premium stereo with a sub woofer is available. There's also a standard Torx toolkit for removing the doors, roof and bumper end caps. Sport models can have 16-inch black steel wheels with 31-inch off-road tires. A Rubicon Hard Rock edition features a black grille and the Alpine stereo. The doors and the hood are made using aluminum, and in that way get the car to reduce fuel consumption. 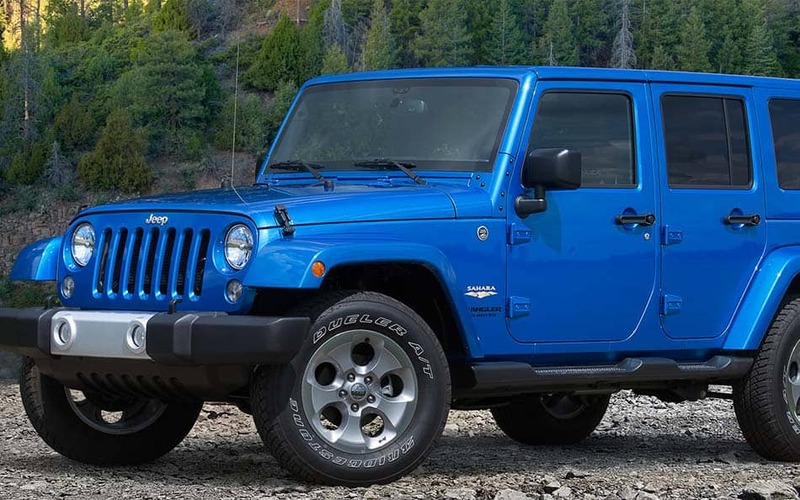 Like the previous model, and the 2015 Jeep Wrangler will be a very practical and easy to use. Inside the driver's cab will be too big a change, except for some systems and equipment that the driver will provide a lightweight and safe driving. Required in every Wrangler Unlimited are: front airbags, anti lock brakes and an electronic stability system. Hill start assist and front-seat side-impact airbags are also available. The combination of open-air freedom, off-road capability and on-road refinement has brought Jeep Wrangler's popularity to an all-time high. Special-edition models also are a staple for Wrangler enthusiasts, and have become available in the latter stages of the model year. For more information on this vehicle, feel free to give us a call today! Learn more about this model on the Official Jeep Wrangler Unlimited Website.